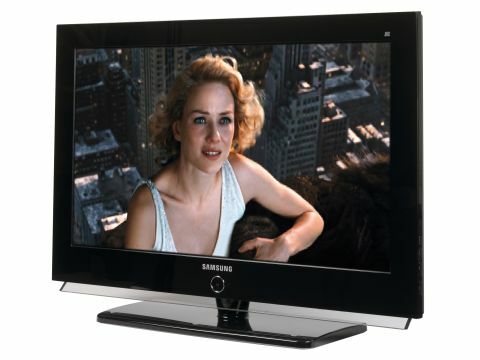 For sheer instant appeal, few TVs can hold a candle to Samsung's LE32N73BD. It looks divine with its combination of high-gloss black bezel and trendy transparent plastic wedge jutting out from along the TV's bottom edge. Then there's the small matter of its £1,000 price: very reasonable for a 32in LCD TV - especially one that appears to tick all the right feature boxes. It's HD Ready, of course, with a native resolution of 1366 x 768, and comes bearing not one but two HDMIs. Plus it's got a built-in digital TV tuner backed up by a CAM slot for adding subscription services and extensive seven-day Electronic Programme Guide support. Samsung's proprietary Digital Natural Image engine (DNIe) picture processing, meanwhile, is out to improve things like contrast, colour tone/saturation, fine detailing, and motion handling. Plus there's a colour management tool permitting individual adjustment of the brightness and contrast of the red, green and blue colour components and direct playback of digital photos via either a 10-in-3 multimedia card slot array and USB port. How well the LE32N73BD performs depends rather more than it should on what you feed it. With our HD King Kong disc, at least, pictures generally look very pleasing. Fine detailing is terrific, for instance, with every little jut and crevice in the black rocks of Skull Island's coastline being immaculately rendered. A new backlight design on the LE32N73BD claims to deliver around 30 per cent more of the 'real world' colour range than you'd normally get from an LCD TV, and this seems backed up by the extreme saturations apparent as Kong fights off planes from the top of the Empire State Building. Black levels are very respectable too, rendering the darkness of Skull Island's night-time shoreline with precious little greyness. There's also enough greyscale subtlety to pick out the smallest differences in the shades of Kong's fur. The only problem with HD footage is that motion can blur a little. Sadly, though, problems become much more widespread while watching standard definition. Colours become less consistent tonally, the picture softens up considerably, motion smearing becomes more dominant, and noise - especially MPEG noise - becomes occasionally excessive. The LE32N73BD also employs 'hidden' speakers tucked under the screen's bottom edge - a great design idea, undoubtedly, but one that seems to compromise sound quality a little, as there's a shortage of power and bass during the epic Kong scraps. Overall, if you're looking for a highly affordable, gorgeously designed HD film/game monitor, the LE32N73BD is well worth a look. However, its weaknesses with standard definition have to be considered before you buy one as a main day-to-day TV.